Naam Gum Naam and I are standing on the edge of a popular playground in downtown Coffs Harbour, where he’s minding his two nieces. Scrambling up a fireman’s pole, Didi, 4, perfectly contrasts the blistering midday sun in her Frozen dress. Piath, 2, glows in a panoply of pink and tiny crown of cornrows. Naam rocks a basketball singlet. I’ve just arrived when Naam is chatting with a man and a woman from Anglicare Coffs Harbour, who are touring the park with three tentative young girls. Six-foot-five, he bends down to handshake the eldest, who tries to disappear into the park bench. “No English?” Naam asks the man, straightening up. “No, not yet. They arrived as refugees six weeks ago, from the Congo,” he replies. Naam whistles slowly and puts his hands on his hips. “Wow, they’re at the very beginning,” he says with the air of someone who’s been there. Born in Khartoum, Sudan, in 1989, Naam was named after the River Na’am that flows northwest of South Sudan’s capital, Juba. One of seven siblings, he’s an avid people person and one of the most well-loved guys in our extensive Coffs Harbour cohort. Larger than life, down-to-earth and everybody’s friend. Sitting down to watch his nieces in the sandpit, we laugh at how little I know about his life after all our years of acquaintance. While both recently living interstate, we’ve only bumped into each other at the odd bush doof – hardly the right time to chat personal history. Now is that time. Born a refugee, and still a refugee, the first personal factoid Naam divulges is about his two birthdays: the second invented six months after his birth at a birth registry in northern Sudan. Here his family were preparing to move to neighbouring Egypt to escape the Second Sudanese Civil War. “My mum was a refugee in the Arab north of Sudan when I was born, and so couldn’t access the hospital or get me a birth certificate, which you need to enter Egypt. The officer decided it was easier to make my birthday that day, 18 March 1990,” Naam explains. Inside Egypt, Naam’s family remained on a waiting list for Sudanese nationals seeking refugee status in the West for 10 years, despite an offer in 1998 from the United States, which his father rejected. “To this day, I still don’t know why,” Naam says. While they waited, Naam’s family forged a new life alongside dozens more Sudanese families in an apartment building in Alexandria, leased by an Egyptian who Naam remembers warmly as “the man”. Seven years after Naam arrived, however, the Arab neighbourhood’s ‘tolerance’ ran dry and they beat up the Egyptian landlord for his affiliation with the Sudanese community. Unluckily, five-year-old Naam was caught in the crossfire. “Some of the Sudanese tenants dragged our landlord to safety while our Egyptian neighbours starting throwing rocks and breaking the windows of our building,” he recounts. Didi shuffles forward to sprinkle sand on our shoes. While his community overcame such adversity together, Naam and his refugee mates had to face their adversaries on the street, where Naam spent two years after being withdrawn from the local school in 1998 (he speaks Dinka, Arabic and English). Though I concur, I can’t help but think of the 2005 Cronulla race riots, Melbourne’s series of attacks on Indian students in 2009, and that, for many Australians, the term ‘refugee’ is synonymous with our government’s horrific offshore detention record. The list goes on. But in global terms, we enjoy freedoms and safety not oft afforded by the 13,750 asylum seekers settled in Australia each year. The arrival of Naam’s family to Australia was arranged and financed by Sanctuary Refugee Foundation in Coffs Harbour. Referring to the heightened sense of anxiety around refugees in Australia, “People are just afraid. They don’t understand why refugees have left their homes. Most people in Coffs Harbour wouldn’t understand why we Sudanese people keep coming here,” Naam says. Until this conversation, I’m among them. Here Naam explains the civil war now ripping his hardy country into senseless heartbreak, again. However, this inter-ethnic conflict involves South Sudan’s rival pastoralist tribes, the Nuer and the Dinka, the latter to which Naam belongs. “It’s a war between brothers, the same people. Our languages have the same accents and words,” he says. When South Sudan’s independence was reached in 2011 – making it the world’s newest nation after nearly 99 per cent of Sudan’s predominantly Christian south voted secession from the Arabic north ­– age-old tensions between South Sudan’s 60 ethnic groups were temporarily downplayed. 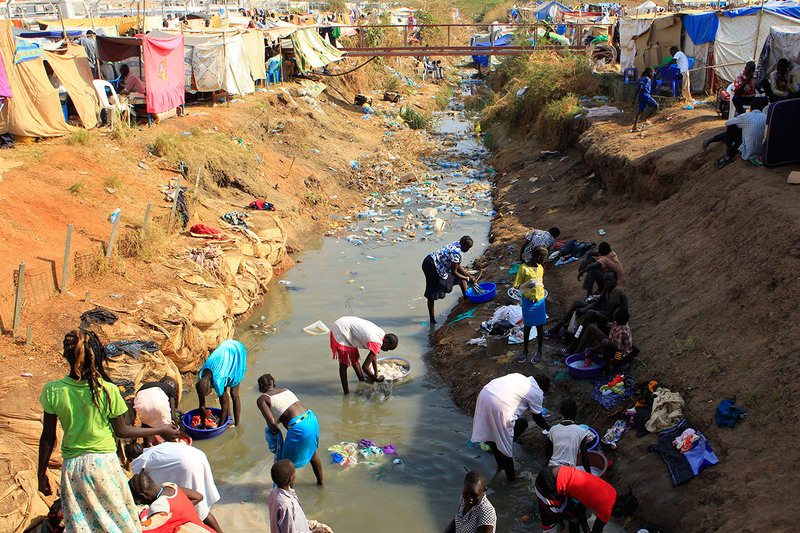 But in 2013, when the President of South Sudan, Salva Kiir – an ethnic Dinka, sacked his deputy Riek Machar – an ethnic Nuer, those tensions erupted into mass killings, mass rapes and village rampages perpetrated by the Nuer and Dinka against each other, leaving tens of thousands dead and millions displaced. Instances of violence between ethnic groups and against foreign aid workers in South Sudan continued well into last year. I ask Naam what it’s like watching it unfold from Australia. Naam plans to be a child counsellor. As the afternoon lengthens across the grass beneath us, I’m reminded of a Sydney Morning Herald article from last year that interviewed dual nationals returning to South Sudan to fight, risking life imprisonment in Australia. It’s hard to picture the level of anguish that would drive a man to that decision. Despite the chaos of his homeland, however, Naam is ever jovial; his enduring positivity, cast like a net over those he meets, conveys not only his story of hardship and renewal, but that of thousands of refugees in Australia who have made unspeakable sacrifices to share what we love: freedom, safety and afternoons in the park.